As Secretary of the Committee in charge of carrying out the plans for the establishment of the Anna Brugh Singer Public Museum, I have been directed by Mr. and Mrs. William H. Singer Jr. to express their appreciation of your offer of cooperation in this undertaking. They hope that all who care to enter the Museum will find a haven of rest where peace and beauty will always dwell, and where, in the contemplation of beautiful works of art, joy will be brought into their lives which otherwise they never could have known. 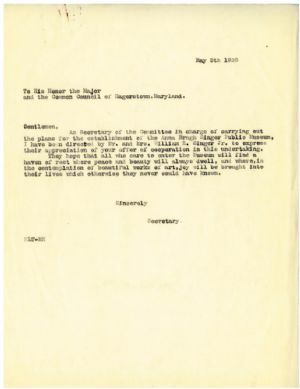 This brief letter is significant to the Museum's history because the Committee Secretary Mary L. Titcomb refers to the Museum as "The Anna Brugh Singer Public Museum,” rather than the Washington County Museum of Fine Arts as it is known today. Other documents suggest that this original name was changed at the request of Anna Singer, who may have decided that the name appeared boastful and did not adequately reflect her desire that the Museum be dedicated to the citizens of Hagerstown and Washington County. Washington County Museum of Fine Arts (Md. ), Anniversaries, etc. ; Washington County Museum of Fine Arts (Md. ), History; Art museums, Maryland, Washington County, History; Hagerstown (Md. ), history.